In-depth Features: Our insightful features will provide you not only information and actionable ideas, but also a broader perspective and awareness of the business world both global and local. Comprehensive Sections: Look no further the new Bloomberg Businessweek is committed to being your single comprehensive news source. Whether it''s Global Economics, Politics & Policy, Markets & Finance, Companies & Industries, or Technology, you''ll quickly understand why you need this information now. You''ll be more informed and better prepared to compete and succeed in the week ahead. Redesigned. Reinvented: New design, new layout, bold covers. Plus, enhanced navigation makes it easy to find what you want, when you want it. National Geographic is monthly i.e. 12 issues and BloomBerg Business is weekly i.e. 52 issues. 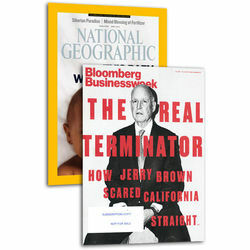 National Geographic, the flagship magazine of the National Geographic Society, chronicles exploration and adventure, as well as changes that impact life on Earth. Editorial coverage encompasses people and places of the world, with an emphasis on human involvement in a changing universe. Major topics include culture, nature, geography, ecology, science and technology. In-depth Features: Our insightful features will provide you not only information and actionable ideas, but also a broader perspective and awareness of the business world both global and local. Comprehensive Sections: Look no further the new Bloomberg Businessweek is committed to being your single comprehensive news source. Whether it''s Global Economics, Politics & Policy, Markets & Finance, Companies & Industries, or Technology, you''ll quickly understand why you need this information now. You''ll be more informed and better prepared to compete and succeed in the week ahead. Redesigned. Reinvented: New design, new layout, bold covers. Plus, enhanced navigation makes it easy to find what you want, when you want it. National Geographic is monthly i.e. 12 issues and BloomBerg Business is weekly i.e. 52 issues. NOTE:If the copy is not delivered to you on a regular basis, we request you to kindly get in touch with us so as to enable us to do the needful.